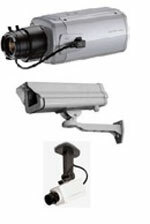 The cornerstone of any video surveillance system is the Video Recorder. 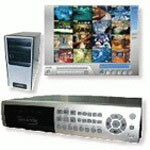 DigiTek Security offers both Digital Video Recorders (DVRs), and Network Video Recorders (NVRs). Both the DVR, and NVR have the same functionality. The main difference is the DVR is used for recording analog cameras, while the (NVR) records network cameras. Recorders display the live camera feed on a TV or monitor. When motion is detected, the video is saved in real time on hard drives. When the hard drives are full, the recorder overwrites the oldest video first. Live or recorded video can be viewed or reviewed either standing in front of the recorder's screen, or over the internet. DigiTek can assist with a large selection of recorders with capabilities and functions to meet every security need. When a camera must be tamper proof, a domed camera is the way to go. 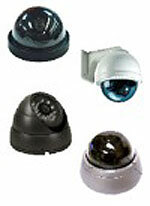 A domed camera is a small camera placed inside of a plastic, metal and/or weatherproof housing. Usually the covering on the camera is "dome" shaped, giving us the name. Infrared emitters can be added to provide better video in poor lighting conditions. Dome cameras can be ceiling-mounted, wall-mounted or even mounted on various brackets, making them the most versatile security camera. "Night Vision" dome provides color video in almost pitch-black conditions. 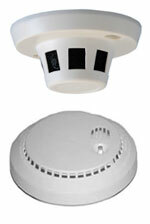 These cameras can be used indoor; outdoor, in well-lit areas; or under poor lighting conditions. Since they are normally on a bracket, it is recommended they be mounted high, providing an "overview" of the scene. In well-lit situations, the picture is in color. When lighting becomes poor, the camera switches on infrared emitters, which allow the camera to produce black and white video. 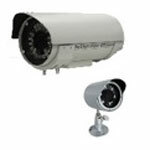 Infrared Bullet cameras come in varying sizes, with varying number of infrared emitters. The more emitters, the further the camera can "see". When you want everyone to know you have cameras (like at banks). When the best possible quality is mandatory. A wide variety of lenses can be used, producing both wide-angle views and tight (zoomed-in) shots. Box cameras can be put into a heated housing for use outside as well as inside. DigiTek Security carries a wide variety of cameras hidden in common devices such as: motion detectors; smoke detectors; clocks; etc. Our most popular special application camera is the license plate recognition camera, which can "read" license plates even in the pitch black of night (just like the red light cameras or toll booth cameras)!